Home > Blog > Can tattoos be removed? In the past in regards to tattoos, what was done was done but as technology has developed the concept of tattoo removal has become fairly normal. So the answer is most definitely yes, tattoos can be removed. Surgical excision of the tattoo was the first main method and is still available. The method involves literally cutting out the inked skin and the sowing the skin back together again. The only pro for this really is that it is painless as you are under local anaesthetic but really you will be left with scarring and it seems like a very extreme option. Other options available are removal by acid – which is as bad as it sounds and creams said to help remove the ink but from most stories these creams simply don’t work. The most advanced method of getting your tattoo removed is by Laser treatment. There are many clinics offering this service now and it is becoming more and more popular. It works by using powerful beams of laser light to turn the ink into tiny particles. These particles are then absorbed back into the bloodstream and then excreted out of the body. There is some pain but it is not unbearable. You will always need a course of treatments with good gaps between treatments. Not everyone sees a 100% removal of the tattoo, sometimes there seems to be a ghostly outline left but from many, many testimonials it seems these tattoos can be as good as gone. 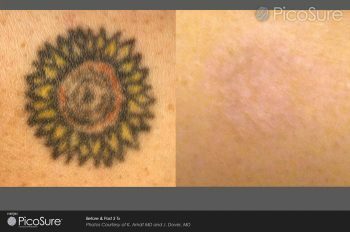 Laser treatment can often be used to lighten tattoos considerable to then allow for an easier and more aesthetic cover up tattoo as well. Many people having tattoo removal don’t hate tattoos in general but just no longer like that specific one. So if you are regretting your tattoo be reassured you really can get rid of it! Find out further information about our tattoo removal services by visiting our tattoo removal page.